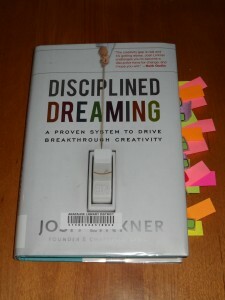 As you can see from the image, I marked many sections and passages I thought might be relevant for librarians. I don’t think I will be able to cover all of them, but I will try to cover most. The author posted the first chapter online, and much of the book is available through Google Books. He also provides a manifesto (PDF). On page 68, he said that “a classic innovation mistake is to project yourself as your target audience…” That is certainly true for librarians. Patrons will often use the library and our resources in ways that we could not foresee or even understand. That does not mean that they are using the library wrong, but the patrons may use the information resources in ways that are more creative than originally intended. Try to act like a six-year-old and play. (Some of the time, not all of the time.) Children at this age may question everything, and they have great curiosity about the world around them. He recommends to “schedule a two-hour block every week or so and use it to put yourself back in a six-year-old mind-set.” (Page 76.) Play with toys, games, puzzles or technology with the same curious mind-set. If you oversee any staff, think of those individuals as your playforce (instead of workforce.) “Work is about completing tasks, maximizing efficiency, and delivering outcomes. Play can do those things too, but we add fun, imagination, movement, and an energizing lightheartedness to the mix.” (Page 99.) For example, get some iPads for the staff, let them play with them, and see how the libraries resources look like through that interface. Fail forward. The great innovators and inventors were not always smarter or inherently more talented. They learned from their many mistakes, and they kept trying after their failures. The best known innovators simply kept trying. They used their curiosity and imagination to try new methods or materials. (Page 101.) If you don’t like one chat reference service, cancel it, and try another. Think Small. Smaller organizations can be more curious and nimble. Larger organizations can try to protect old ideas instead of creating new ones. Large organizations may be good at incremental change, but they may have a hard time creating a breakthrough innovation. (Page 103.) If you happen to work in a large library organization, all is not lost. You can still use your own imagination and creativity to solve problems within your sphere of influence. Break out of the beige cube farm. Your physical environment has a big impact on your creativity. (Page 110.) You may not be in a position to give yourself a new office, but you can change your environment. Put up some nice posters, or take some good long walks during lunch breaks. Do something every once in a while to put yourself into new surroundings. This shouldn’t be a tough one–immerse yourself in magazines. Select about 10 completely different magazines to see other people’s perspectives on the world. Take a look at magazines like Digital Photography, Modern Drummer, Field & Stream, Sky & Telescope, or Backyard Poultry. Surely, you can find something with interesting viewpoints. Change up the routine for meetings. Use different rooms for weekly or monthly meetings. Change the order of the meeting agenda. Conduct meetings at different times of the day. (Page 158.) There are many ways that weekly staff meetings could be jazzed up to be different or unique. EdgeStorming. This is kind of like brainstorming, but the idea is to take it to an extreme. 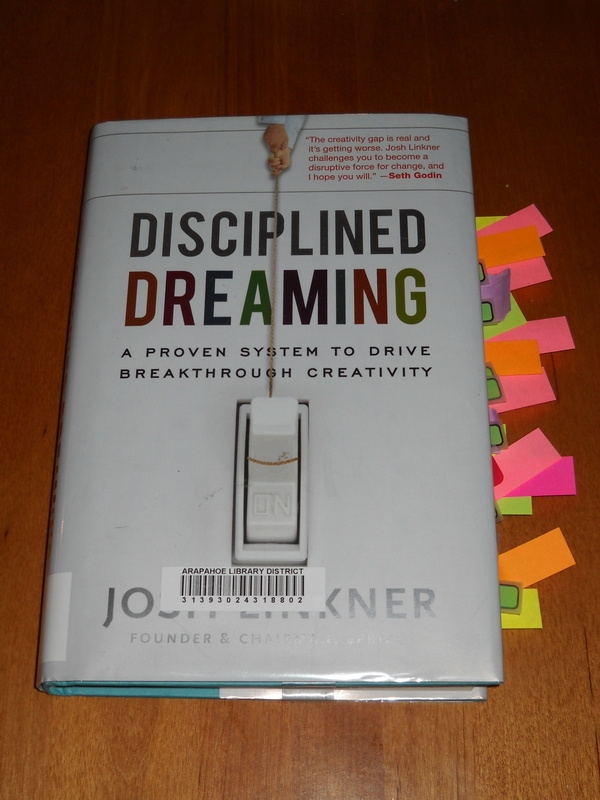 Go “far beyond small incremental changes and connect with exaggerated thoughts.” (Page 167.) Don’t just try to slightly improve the efficiency of your InterLibrary Loan (or document delivery) service, try to think of something radically different. Conduct a meeting where people can recommend wild and bold ideas. The long list. Librarians might be good at this one as well. Assign a group of coworkers the task of coming up with a HUGE list of responses for a project. For example, maybe you have a new chat reference service, and you would like to let your patrons know about it. You could ask your coworkers to write down 50 ways in 30 minutes that the library could communication that information. The team might start out with some of the easy and obvious methods, but then the strange, inappropriate, stupid and bizarre methods might get jotted down. This will force people to stretch their creative capacities and imagination. (Pages 168-169.) Sometimes, the best ideas may get thrown out there at slot 16 or 39. RoleStorming. Pretend that someone who is innovative or creative is at a meeting, even though that person isn’t really there. (Page 170.) The author used Steve Jobs as an example, but maybe S. R. Ranganathan could be that person. What would he think of the project at hand? This might let some people who are risk averse be more comfortable mentioning a crazy or strange idea. If someone says that Ranganathan would have a whacky idea about an ebook system, that is fine. The person wouldn’t have to worry as much about negative feedback. Role playing is also discussed on page 193. This could be a good technique to help determine which ideas make the most sense for your patrons. In a meeting, librarians and the staff could act out a variety of service scenarios. If the library is thinking of merging two service desks, what kinds of questions might confound some of the staff who don’t work at the other service desk? The opposite. Find the worst possible answers to a problem. (Page 173.) What is the worst way to deal with patrons who have fines under $5.00? Send them bills through FedEx next day service. Call them every night around 10-11pm until they come in to pay. Send their accounts to a collections agency. Brain Writing and the stepladder technique. Sometimes, group-think can be a creativity killer. The author noted that “in some cases, the entire group echoes the ideas of the most vocal or high-ranking people.” (Page 177.) These two methods can help bring out ideas from some of the less vocal members of a team. Policies vs. guidelines. (Page 188.) Libraries can be places filled with policies. What if the policies became guidelines? This might encourage library staff to use more creativity when dealing with issues or problems. The staff might find positive ways to bend the rules when they need to be bent. Make some multimedia. The author recommends that the team or group could make a film, song, painting or a story in response to a project. (P. 196.) If a group of librarians would like to advertise the availability of a new database, they could make a painting of it, and create some posters to put up around the community. Demonstrations. Have a demo day where librarians and staff take 5 minutes to talk about a different resource. (P. 197.) This could be conducted in lightening rounds where 24 resources are mentioned in a two hour time span. Bring in food to get patrons to attend. Mach 10 innovation. The author noted that his company flipped their innovation cycle upside down. In the past, the cycle was Idea –> Development –> Sales. In 2008, they changed to Idea –> Sales –> Development. (Page 198.) While the advice in this section initially seemed more relevant to the corporate world, I took it as advice to release new services or products in Beta form. If the patrons don’t take advantage of a new service or software offering, then the library can learn from the project and reconsider. Setting your metrics. There are many librarians and library staff who love statistics and data. For the project however, he recommends that the team should not monitor too many metrics. (Page 201.) The team should only monitor the five to eight of the most important metrics. Does the gate count increase? Did ebook use go up? Did coffee sales increase? Did the per capita late fines go down? If you can get a copy of this book, it is worth taking some time to read and implement some of the ideas. While the book is geared to individuals in business settings, I think that many of the concepts could be co-opted for those in libraries or other non-profit organizations. love this journal but have lost track of how I got here while “playing around”! please keep me posted.